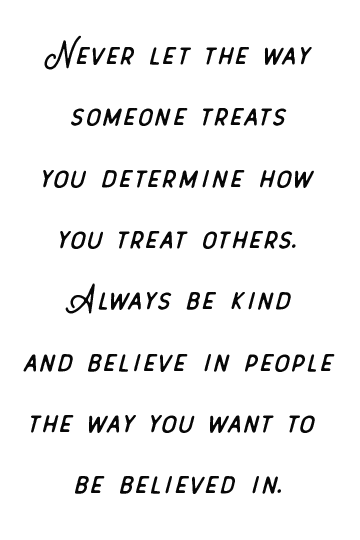 A Challenge to Live Minimally. 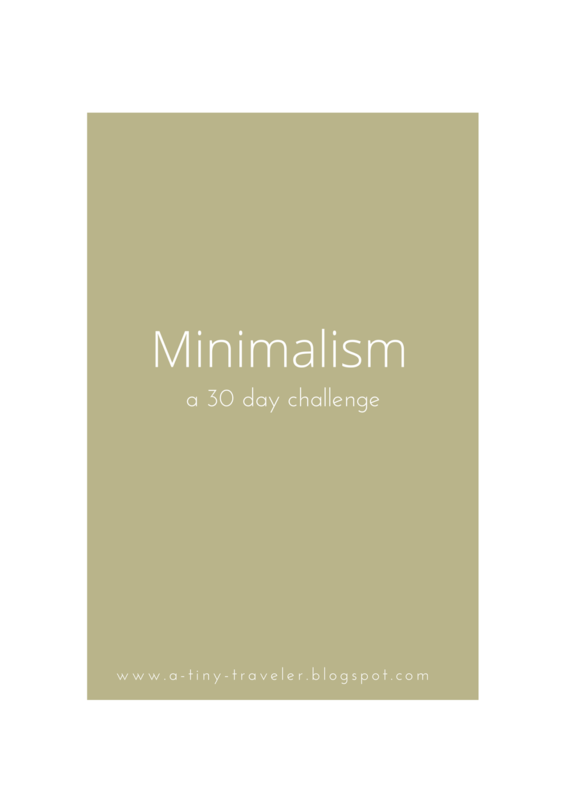 This month I have decided to take on the #30DayMinimalMe challenge with Katherine as well as the 30-day minimalism challenge at Into Mind. They are both super encouraging at pushing me towards the simple living that Mark and I are striving for as we prepare for marriage and our life together. What better time to start these great habits and practices than the month leading up to our marriage month? So far, things have been going smoothly. I like doing both of the challenges at once because it helps me get organized as well as challenge me to really push myself towards a goal that I love. No one ever said that downsizing and living minimally would be easy! In fact, I'll be honest I went online a few times on the day that we are supposed to log off (not as much, but still). I would love to invite you to join me as I take on these challenges this month! Below are two of the summary photos for the challenge that you can save to your phone or desktop and use for guidelines. I know that they are a little small, but if you click on them they'll take you to the original sites to get started! 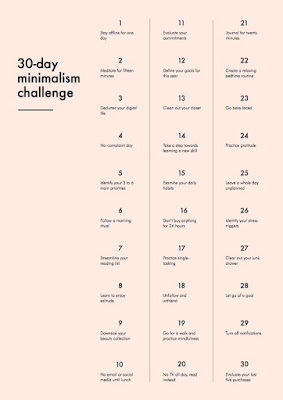 Be sure to document any challenge updates on IG or Twitter with the hashtag #30DayMinimalMe as well! 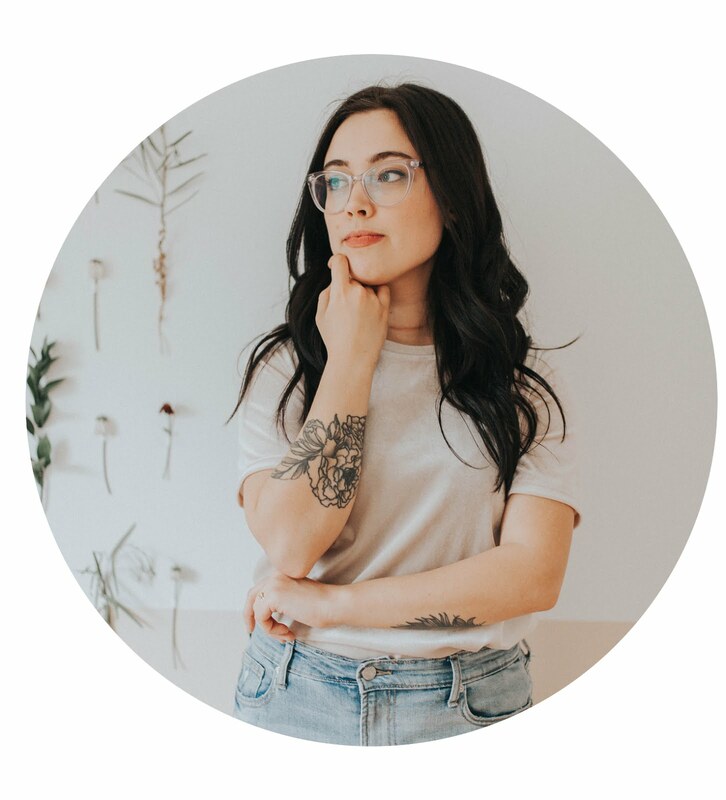 For an extra boost of encouragement, I want to share a few thoughts on living simply and striving for that minimalism lifestyle. Most of us reach for our phones right when we wake up. It's just our 21st century nature. Technology overload, always wanting to stay connected. It's not necessarily a bad thing, but what happens when that becomes our first thought every day and we forget to look out the window at the sunshine and listen to the birds sing. We get so worried about instagramming our cup of coffee that it gets cold! I admit 100% that I get caught up in this too and it's one of the reasons why I want to challenge myself to take a step back and get back to the simple basics. I believe that when I start living simply I can get more things done, I can rest, I can breathe easier, and I can spend more time doing the things I love with the people that I love. So here is the call to join in. Put down your phone and look around. Admire the trees and the sunshine. Marvel at the architecture of your city. People-watch and say hello to passersby. Enjoy each moment and let God speak to your heart. You'll hear him more clearly when you get your face out of your phone or computer. Take some time to read that book that's been sitting on the coffee table for weeks. Clean your bedroom! (Goodness knows I need to). Write a letter to a friend you haven't seen in a while. Do what you love, without worrying about taking 20 pictures! This challenge couldn't have come at a better time. Won't you join me? 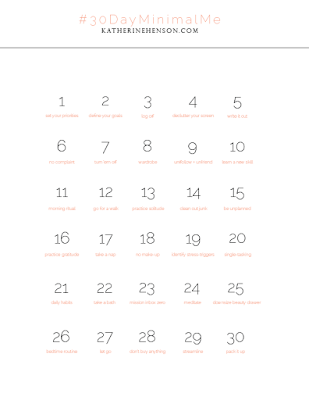 Need even MORE ideas and inspiration to get you on that minimal track? Check out this Pinterest board I made that can get you moving in the right direction.